Breakfast was a homemade feast of breads, croissants and jam made by our B&B host - with lively Brexit conversation and a brief spell of 'Spot The Beatle' on her father's school photo from 50's Liverpool. After oiling my chain and checking the tyres, we set off into 75 miles of hills, strong head winds and forecast rain. The route took us away from the major roads, and down a series of winding country lanes with ridiculous ascents and descents. Here's the maths for you - it takes a fraction of the the time to go down a steep hill than climb the next one - so your average speed really suffers. This only matters when you're on a long trip and you're keen to get an idea of when you'll finish for the day. D'oh!!! Just before lunch the heavens opened, and we got into the 'waterproof' clothing - sweating our way to lunch. This was a nice ham sandwich and fancy bakery items from a Boulanger with an impossibly chic hairdo - consumed in the lovely Bastille town of Saint Clar while we dried our wet kit. The afternoon was a pig, and when we eventually reached the outskirts of Toulouse, we were prepared to be impressed. So, it turns out that the Airbus factory makes Nissan in Sunderland look like the back of my garage, and the cycle paths around it would rival any arterial route off the M1. Although you need some kind of Jedi force to know where you have to go at most of the road junctions. As more biblical rain started to come down, none of that mattered though - and by the time we found the hotel, I was prepared to fight anyone standing between me and a hot shower. Fortunately that wasn't necessary - we just got our laundry done, had six pints and an Indian, and decided it had all been more than worth it. 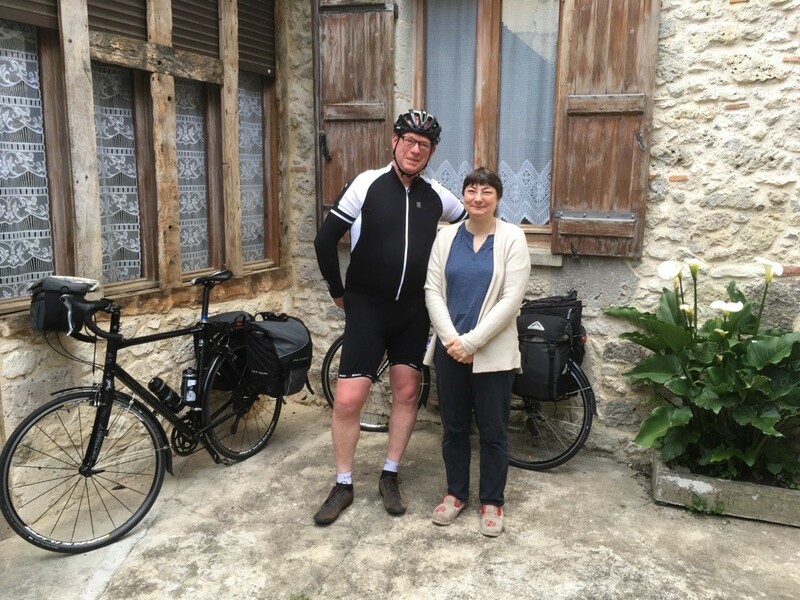 Tomorrow we face thunder storms and fury - but only 56 miles to Carcassonne.